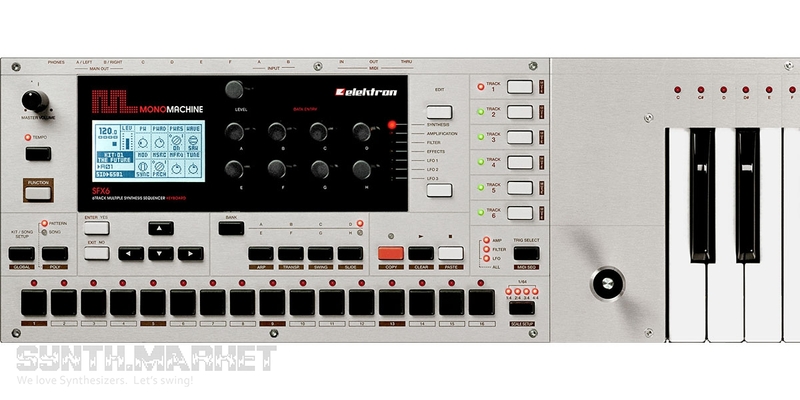 Monomachine is an Elektron legacy instrument which was first released in 2004 featuring 6 voices of polyphony and 6-part multitimbrality. 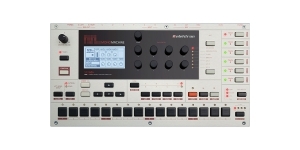 Monomachine incorporates a synthesizer and sequencer and comes as a SFX-60 desktop sound module and as a SFX-6 model which is a 37-note keyboard. Monomachine SFX6 is a limited edition 3-octave keyboard featuring a multi-trig mode and a special joystick integrated for sound manipulation. The device offers two modes of polyphony: 6-part mono or you could get a one 6-voice poly instrument. Monomachine comprises a few various synth types incorporating 5 individual monosynths among which there were SuperWave, FM+, SID, DigiPro, and VO. 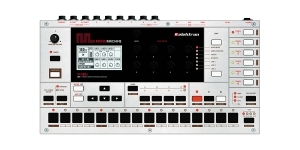 The unit offers 18 LFOs allocating three of them per track, a 4-pole resonant multimode filter, a VCA with an AHDR envelope, a 6-track sequencer, multifunctional arpeggiator, 128 (per 6 banks) user programmable patches and 128 user patterns. Monomachine is amazing thanks to it synthesis versatility – consider 5 synthesizers in one. FM+ is based on frequency modulation algorithms: three FM machnies were manually crafted and represent custom made components featuring their own individuality. DigiPRO is about 12-bit digital waveforms and comprises 4 blocks: DigiPRO Beat Box offers 24 percussion samples, DigiPRO Wave gives 32 waveforms, DigiPRO Doubledraw allows for blending two waveforms in order to achieve some unique sound receiving an oscillator based on different waves, and DigiPRO Ensemble let you use fixed DigiPRO waveforms and user uploaded ones. The SuperWave analog modeled type synthesizer are responsible for providing with dense voltage feel sound which helps to create thick basses and leads with saw and pulse waveforms. The SID is a monosynth built on the Commodore 64 SID chip ensuring high quality synthesis. VO unit of Monomachine is a voice synth based on traditional formant-synthesis-derived modeling methods. Work with a selection of sounds, formant filters applying some noise. Sequencing can be both real time or in a step mode and features a parameter lock function memorizing all the edited parameters for each step. The generated voices as well as external sources owing to 2 audio inputs can be put through multiple effects. 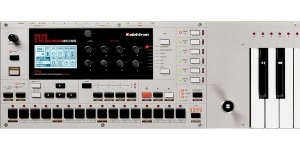 The MKII version was introduced in 2008 featuring a more compact design, an upgraded OS, making user waveforms loading available, and offering Doubledraw and Ensemble units of the DigiPRO synth which weren’t introduced in the original version.